Super High-Power Switching Apparatus (SHPSA) with Virtual Battery. Super High-Power Switching Apparatus (SHPSA) with Virtual Battery. 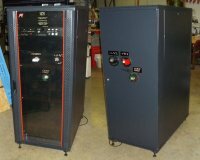 The SHPSA-200A400/100V05F has a Power Rating of 80kW (average), 600kW pulse. Switches installed for handling 200VDC (140VAC) & 400Arms . Built-in adjustable pulse generator, once triggered, would deliver a 10ms pulse. For your unique application that required a different voltage, current or speed, do not hesitate to send us an email to: info@vsholding.com for any additional information, delivery schedule and prices. UPEL-2500 Bench Top Electronic Load Simulation System. It is designed for DC/AC power sources, power electronic devices and component testing. 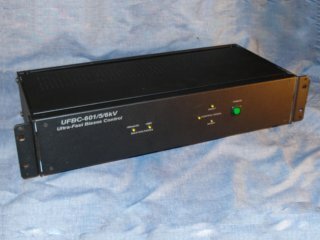 The high power rating, AC/DC capability, manual and remote controls make these loads the ideal tool for testing the high power UUT such as SMR, UPS, telecommunications equipment manufacturers, power suppliers, drivers, battery and other power sources that operate from DC to 100 KHz. For your unique application that required a different voltage, current or speed, do not hesitate to send us an email to: info@vsholding.com for any additional information, delivery schedule and prices. Louisville, Kentucky, USA, – June 30, 2018 – Electronic Design & Research, Inc. announced the delivery of SHPSA-650A103F08, a 1,000 Amps Solid State Switching Apparatus (SHPSA) for various power tests to MET Laboratories, Inc. Santa Clara, CA USA. Electronic Design & Research Inc. announced today of achieving a registered trademark on its logo from the United States Patent and Trademark Office. EDR/VSHOLDING extends a line of DIN rail mountable devices by introducing the DPDT (2C Form 2B) family of SSRs mimicking 100% comparable electromechanical relays. DT1L's family - EDR/VSHOLDING announces the xTxL family of SSRs with high precision, wide hysteresis window comparator and varied contact forms rated at various voltages/currents. iMDxx family - Isolated Brushed DC Motor / Piezo driver with Power Ratings up to 21KW - EDR/VSHOLDING introduces a new family of isolated Brushed DC Motor drivers based on H-bridge configuration can be used for driving Brushed DC motors, power converging or driving a Piezo transducer with doubling power. EDR/VSHOLDING announces DIN Rail mounted SPST, SPDT, DPST, SPDT&N Solid-State Relays/Switches and half & full-bridge drivers. A wide range of devices are available off the shelf and are rated at a variety of output voltages, output currents, input control voltages and power requirements. EDR/VSHOLDING introduces 900 VDC / 9.5 kW 10 ns rise time Full-Bridge ISO-drivers for applications where delivering kilowatts of high-frequency power is a must, such as a voltage booster to piezoelectric transducers and DC/DC converters, bidirectional PWM control, etc. EDR, Inc/VSHolding is proud to announce the third generation Ultra-Fast I-V Biases Generators (UFBG) designed for real -time MRI, Magnetic Resonance Spectroscopy (MRS) and Ultrashort TE (UTE) Imaging. High Power Panel Mount Relay. up to 1500 VDC & 150 Amp. Low control power of only 1.4mW at 2.8 VDC. EDR/VSholding Announces the first shipment of W1F30D14/5 highspeed DPST/SPDT relays/switches. "High Efficiency All-Electric Vehicle Propulsion System"
Micro-Power Solid-State Relays Output to 3.5kW of AC or DC voltages with a control of only 0.6mW.